In his upcoming exhibition at Marianne Boesky Gallery, Minneapolis-based artist Jay Heikes explores the entanglement of physical, perceptual, and intellectual barriers. Inspired by today’s social and political tumult, the show, aptly titled Keep Out, is Heikes’ meditation on the intensity and ubiquity of socially-constructed boundaries and their powerful ramifications to both individuals and communities. 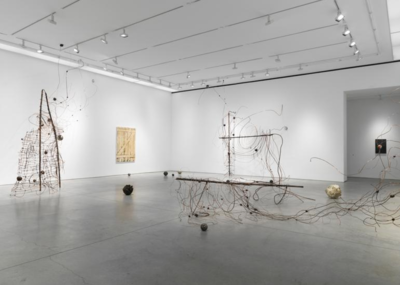 Keep Out, on view at 507 W. 24th Street from May 5 to June 17, 2017, features a large-scale copper, wire, and wax installation and a selection of new multimedia wall works from his “Zs” series. Together, the works reflect on and offer a prayer for transcendence in the face of the ongoing and seemingly endless onslaught of shocking and negative news. 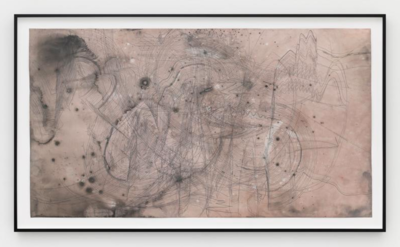 For Keep Out, Heikes expands on his “Music for Minor Planets” drawing series, first started in 2013, releasing the delicate, graphite compositions from the two-dimensional confines of paper and wall and transforming them into a large-scale sculpture. The three copper sculptures, each measuring 10 feet in height, 15 feet in length, and 10 feet in width, visually references sheet music and will occupy much of the gallery’s floor space. Its bars, made of bent wire, expand and contract within and beyond their frames, engaging the surrounding space and seemingly reacting to unseen forces. Its musical notes, appearing as wax orbs, are in some instances affixed to the bars and in others have fallen to the floor, scattered. The work at once compels and repels the viewer, contributing to the overarching sense of tension. The sculpture takes inspiration from some of Heikes’ favorite musicians like Terry Riley, and highlights the power of additive intervention to change and alter artistic intention and experience. The sculpture is presented in dialogue with a selection of new “Zs” wall works, part of an ongoing series the artist began in 2016. These pieces signify the push-pull between introspection and the realities of the outside world. They reference the fleeting moment between sleeping and waking, and underscore the significance of the dreamscape to self-reflection and regeneration. At the same time, their physical form obscures the view beyond them and conjures the same sense of caution and exclusion that an “x” might. This dichotomy serves as the core of Heikes’ current explorations, looking at the way barriers are both imposed and overcome. Of the exhibition and his recent work Heikes says, “I can see the horizon. It's a sunset shade of pink and brown, burned across the outlines of some thing’s lips. … Is this nature? Or a god to be heard in pale tones? … Either way, it's a view from a room that's been boarded up for years. It's a good room, though sometimes a filthy and misaligned place. But now it is suddenly scalped. Roofless. The elements have managed to erode its frame, and the imaginary guards have abandoned their posts. Is this what it feels like to surrender? Jay Heikes’ heterogeneous practice mixes and reinterprets a kaleidoscopic array of media, activating stories, puns, and irony in a cyclical meditation. 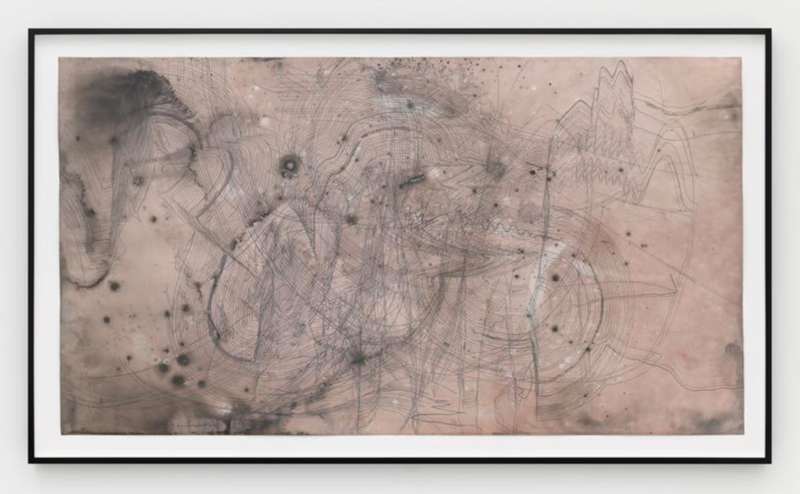 His most recent bodies of work explore evolution and regeneration, stasis, and corrosion, reaffirming the notion that mutation and change are essential to the creative process. 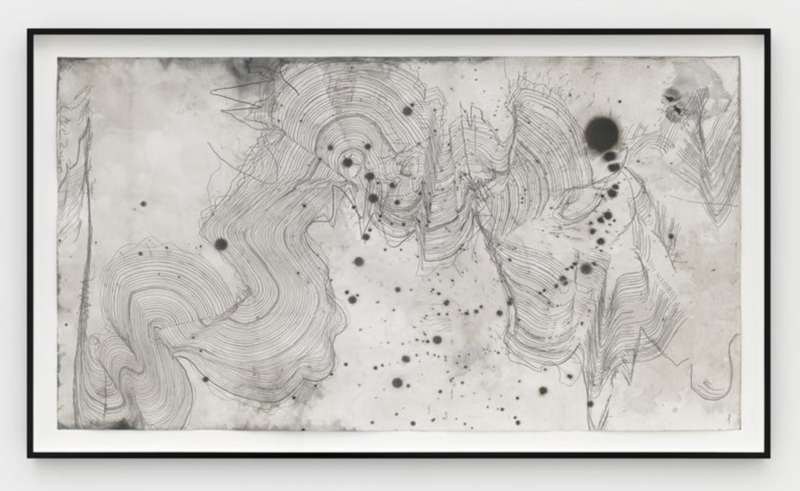 Following his first solo presentation at Artists Space, New York in 2003, Heikes participated in a number of group exhibitions at venues such as the New Museum of Contemporary Art, New York (2003) and the Renaissance Society at the University of Chicago (2002 and 2005). In 2006, Heikes was included in the Whitney Biennial: Day for Night, curated by Chrissie Iles and Philippe Vergne. Since then, Heikes has been the subject of numerous domestic and international exhibitions, including shows at The Institute of Contemporary Art, Philadelphia (2007); Federica Schiavo Gallery, Rome (2011); the Aspen Art Museum (2012); Grimm Gallery, Amsterdam (2015); and Shane Campbell Gallery, Chicago (2015). Keep Out marks Heikes’ fifth solo exhibition with Marianne Boesky Gallery.